Copa del Rey winners list – Copa del Rey is an annual football cup competition for Spanish clubs. Copa del Rey (CDR) first held in 1902 and become the oldest soccer tournament in Spain. Currently, Copa del Rey is a secondary competitions beside Spanish La Liga. Barcelona is known as club with Copa del Rey most winners. They have won 29 Copa del Rey titles. Other clubs with most Copa del Rey titles are Athletic Bilbao and Real Madrid. First held in 1902, Copa del Rey is the oldest football tournament in Spain. Athletic Bilbao is the first Copa del Rey winners. Teams that inivited to enter Copa del Rey are from La Liga, Segunda A, Segunda B and Tercera Division champions. 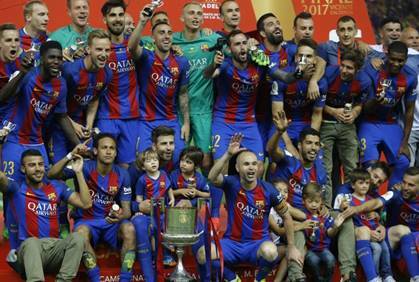 Currently, Barcelona is the Copa del Rey holder, winning their 29th title in 2017 after beat Alaves in final match. To date, Barcelona also become club with most Copa del Rey titles. Barca won 29 trophies, first won it in 1910. Next best team are Athletic Bilbao with 24 titles, while Real Madrid only won 19 titles, making them as third best team in Copa del Rey history. Other top-tier Spanish club like Atletico Madrid (10 titles), Valencia (7 titles) and Sevilla (5 titles) also make into list of Copa del Rey past winners. So which other clubs join the Copa del Rey champions list each year from beginning to present day. Here are the complete table of Copa del Rey winners list along with list of Copa del Rey most winners of all time. Barcelona still hold record as most succesful clubs in Copa del Rey history with 29 trophies won, while Real Madrid only won 19 trophies, lose out to Athletic Bilbao with 24 trophies as second best team in Copa del Rey. Barcelona and Real Madrid are two favorites to win Copa del Rey competitions in the next seasons while other teams like Atletico Madrid and Sevilla also become dark horse to add their name in Copa del Rey winners list. Copyright © 2018 SkyRockLiving All Rights Reserved.